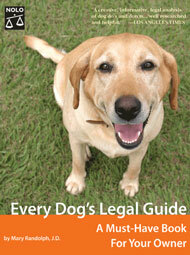 Welcome to Dog Law Web site (version 1.0) from Nolo, Justia and Little Sheba the Hug Pug. This first set of resources have been put together by Nolo's Mary Randolph. Sheba and her team will be adding additional information in the coming weeks and months with additional resources and information for pups and peeps. Dangerous Dogs includes information about - dangerous dog laws, criminal penalties for owners of dangerous dogs, and breed-specific restrictions.